On this date in 1816, England hanged five men for a bread riot. The war against Napoleon, only just concluded, had from 1812 enthroned a dyed-in-the-wool reactionary government under the Earl of Liverpool. The 1810s were rough years for England’s working population, and distinguished by violent class conflict whose suppression was among the Crown’s chief cares. The particular locus of conflict here is the most pressing and ancient in civilization: the price of bread. During the Napoleonic Wars, Napoleon had embargoed continental Europe’s trade with Britain. With the Corsican’s end, the Tory government had in 1815 enacted Corn Laws protecting English grain markets from a sudden onset of competition. This sop to the Tories’ landowner supporters propped up the already inflated price of bread and triggered social unrest throughout Great Britain. Preoccupied as she was by the specter of Jacobinism, London could hardly imagine that even geology was conspiring against her: the gigantic 1815 eruption of Mount Tambora in Indonesia caused a global volcanic winter that made 1816 a year without a summer in the northern hemisphere — crippling agriculture across Europe. But the bottom line was that war-inflated grain prices having fallen precipitously in the immediate aftermath of Napoleon’s defeat turned right around and spiked back up once British farmers were protected from import competition. Wages, it need hardly be said, did not enjoy a similar spike; to the contrary, they were suppressed by the legions of demobilized soldiers who returned from Waterloo in glory to discover a ruinous cost of living with scant prospect for employment. Dr. Marjorie Bloy contends that Britons “suffered more, economically, socially, and politically” during the aftermath of the Napoleonic Wars than during their prosecution. Their brethren out to battle — why? for rent! Blood, sweat, and tear-wrung millions — why? for rent! To die for England — why then live? — for rent! Of these high-market patriots; war was rent! How reconcile? by reconciling rent! And will they not repay the treasures lent? No: down with every thing, and up with rent! Being, end, aim, religion — rent, rent, rent! On May 22, 1816, some residents of the Cambridgeshire village of Littleport collected at a local pub to commiserate with one another about this common grievance. Fortified by their tankards, the crowd spilled out into the streets and began abusing their most prosperous neighbors — in some cases merely menacing them; in others, invading and looting homes, extorting money, and gorging on wine. A Rev. John Vachell fled the unfolding riot to the nearby (and larger) town of Ely where he alerted authorities. By daybreak, the Ely rioters, now swollen to a mob of hundreds and armed with pitchforks and guns, had arrived at Ely too. There local grandees engaged them in a dilatory negotiation with liberal wage concessions to mellow the mood — while the dragoons, cavalry, and militia that had been called for at Rev. Vachell’s first alarm were being summoned from Bury St. Edmunds. They did not arrive until late the afternoon of the 23rd, and were not able to press their confrontation with the unrulies until the following day. A small-scale but frightening urban skirmish took place on May 24 with rioters firing at the gendarmes from houses and the soldiers returning same, until the crowd was pinned down at last in the George and Dragon and from there its members either surrendered or scattered to flight. Out of an estimated 300 or so rioters, about 80 went to trial, and 24 received capital sentences — all of this taking place within a month after events. The court understood in imposing its sentences that the punitive bloodbath would be a bit more constrained: 19 sentences were commuted, many of them joining comrades who had been directly sentenced to convict transportation. 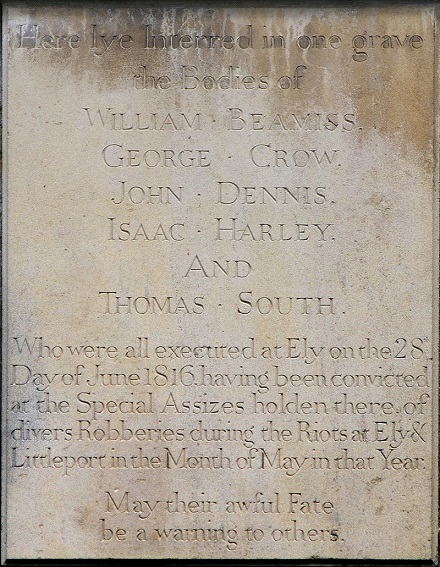 William Beamiss, George Crow, John Dennis, Isaac Harley, and Thomas South were the five left to pay for the day’s excesses; their black-shrouded gallows-cart had to be rented from Cambridge lest a local provisioner incur the wrath of the populace. Though the speaker evidently meant his words earnestly, some of those onlookers scrabbling to afford their daily bread must have heard them with a certain amount of bitterness. To argue the law’s strength is not to argue its justice. But the address, and the strangulation that its author was put to directly thereafter, served their purpose. Cambridgeshire’s fens became quiescent — though it was very far from deterring the rest of the English working class. The Corn Laws were not repealed until 1846. * Edward Christian, older brother of HMS Bounty mutineer Fletcher Christian, was Chief Justice of the Isle of Ely (not a literal island) and one of the presiding magistrates at the rioters’ tribunal.